The Group structure enables us to bring out the best from both countries – Swiss management and quality combined with the exceptional engineering skills from Eastern Europe. 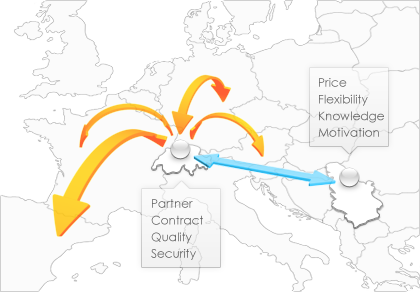 The Swiss company is primary contractor of all services providing the appropriate guarantees and protection for its clients under the EU laws. Perspectives is dedicated to providing high quality standards in management, QA, and engineering practices leading towards a successful project execution, ranging from small enterprise to the corporate level. If you should have questions about our products or services, or if you would like to receive a free quote for any of your projects, please contact our office by mail or phone.